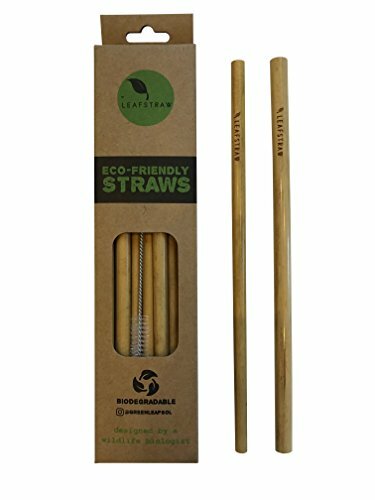 Biodegradable Bamboo Drinking Straws, Alternative To Plastic, With Cleaning Tool, Pack of 12-100% Organic, BPA Free, NON Toxic, No Inks or Dyes by Leaf Straw at Animal Backgrounds. Hurry! Limited time offer. Offer valid only while supplies last. COMPASSION - Over 100 million marine animals are killed each year due to plastic debris in the ocean. Your decision to substitute plastic straws with our Reusable, Biodegradable, Bamboo Straws shows that you care and are willing to act. CONVENIENT - Forget about using polluting and toxic plastic straws ever again. Our reusable and easy to clean straws (straw cleaner included) are sleek and can be carried around with you anywhere. Show to the world that you are willing to stand up against single use plastic and make a difference. PERFECT DESIGN - Our straws are made with certain quality standards that ensure good durability and drinking quality. Other straws are too narrow and hard to drink from while others are much too big. We offer the optimum size for drinking. ECO FRIEDNLY, 100% ORGANIC, PESTICIDE FREE - 100% Natural and Organic Bamboo grown and ethically sourced on a mountainside in Jiangxi, China. NON TOXIC, BPA FREE, AND NO HARMFUL INKS OR DYES - All factors we take into account when making our straws. By choosing our reusable Bamboo Straws you could be eliminating up to 35,000 plastic straws in your lifetime. If you have any questions about this product by Leaf Straw, contact us by completing and submitting the form below. If you are looking for a specif part number, please include it with your message.